The Olive sparkle Emerger saves the day... I'm demo'ing it at ifish on November 30th. I don't know why I've not posted for over a year but it's not because I've not been fishing. I suppose most interests wax and wane so why should blogging be different? Anyway, I spent a few hours on a little stream near home this afternoon. I told Gina (my wife) that I had a hunch some olives or BWO's would come off in the early afternoon. The weather looked about right on the forecast. So I packed the tackle, said I'd be back in the late afternoon and headed off. I started on a stretch I've not fished for 3 or 4 years. It's only a few hundred metres downstream of an area I fish quite often. It looked good and I figured the slightly deeper water might hold some grayling given the browns would probably be in faster water spawning. I worked hard. I worked close in, far off, the surface, the middle and I dredged the bottom. I fished small, large, dull and bright. I worked my drifts with extreme care. I worked them dead, I jiggled, skated and swung the flies. Not a fish. I didn't even see one. No olives or BWO's either. Some small midges though. Then I thought I'd have a look at the little tributary on the way back to the car. I love this little trib. It was gin clear and with my first peak over the edge I spooked a really nice grayling holding in shallow water. I walked up a little way, slid into the current behind a fallen tree and adjusted the rig to a dry emerger olive with the Olive Sparkle Emerger a foot below. The bend pool was just ahead so I stood still for a few minutes to let the fish settle after my entering the water. I made the first drift... a nice brown ate the dry and he dropped off. I waited a few minutes to let him chill. I made the second drift. Nothing. I made the third drift and moved the nymph ever so slightly as it passed in front of where that brown ate. He came up and ate. Nice. I climbed out of the water with a big grin on my face. This pattern has pulled tons of fish for me since I started fishing it again this season after probably 8 years of having forgotten about it. There are 3 highly effective elements to this pattern. The first is a trigger to attack, the second and third convincing imitative elements: First, the wing buds emerging from the thorax which say "I'm emerging %^&*! now so hurry up and eat me!". Second, the olive dyed golden pheasant tippet tail fibres and third, the olive turkey biot body. I'll be tying this pattern as well as my dry emerger and dun imitations of the same olive uprights at ifish on 30 November. This is the first year for this show, put on by the Sussex Fly Dressers Guild, so please support it. There'll be quite a few of us tying as well as casting demonstrations by some seriously good casters as well as lots of tackle stores and maybe even some beer! 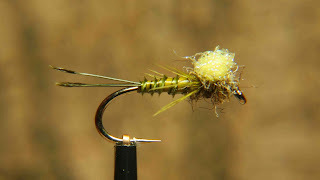 Come say hi and I'll tie you an Olive Sparkle Emerger.